Buffalo Lodge Condo are River Run condos in Keystone Real Estate. Buffalo Lodge was built in 1997 and has 90 residences. These 90 condos are broken down into 7 – studios, 45 – 1 bedrooms, 31 – 2 bedrooms, and 7 – 3 bedroom condos ranging in size from 407 – 1638 square feet. 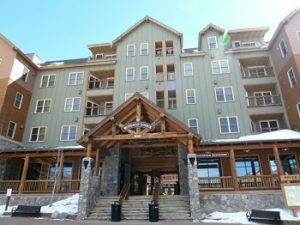 Located near the summer mini golf course and ice skating rink in River Run and less than 200 yards to the Keystone Ski Resort gondola, Buffalo Lodge is steps from all the restaurants, bars and shops River Run has to offer. The lobby in Buffalo Lodge is nice and spacious with a lounge area, pool tables and ski locker room. Next door to Buffalo Lodge Condo is Dakota Lodge where owners and guests of Buffalo Lodge can use the steam room, outdoor heated pool and hot tubs which have views of the Keystone Ski Resort. If you are looking to purchase a condo for sale in Keystone CO and enjoy being in the action the lodges and condos in River Run are where you want to be. Take a look at the condos in River Run like Buffalo Lodge Condo, you won’t be disappointed. Whether you are looking for a condo, townhome or home for sale in Keystone CO Real Estate or Summit County Real Estate, contact Justin and Krystal Knott with LIV Sotheby’s International Realty. We can provide you access to the properties, previous sales data, market information and more. *Please note that Buffalo Lodge and Dakota Lodge are listed under the same name in our MLS “Buffalo Lodge and The Dakota Condos” so condos for sale in both complexes will be listed below. The best way to differentiate between the complexes is by the address, 100 Dercum Square is Buffalo Lodge and 150 Dercum Square is Dakota Lodge.